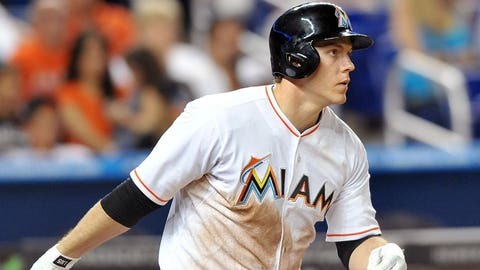 Logan Morrison played his first four years in the majors with the Marlins. With trade rumors swirling for weeks around Marlins first baseman/outfielder and social media superstar Logan Morrison, The Buzzer asked him to write a column on what it’s like to be traded; what are the emotions a player goes through leading up to a deal. Here are his thoughts. Doesn’t have the same effect when it’s not Morgan Freeman reading it in your head and it’s not life and death. Either way, this is the most difficult thing I have ever had to write, but I owe it to myself and the fans to try. This is supposed to be about perspective. How am I feeling at this interesting time in my life? But, the thing about feelings is, I don’t know much about expressing them. My family would definitely back me up on this. Now I have to put it in writing for the world. One side of me — the side I know I’m supposed to listen to — is telling me, "Do your job. Don’t listen to the rumors!" 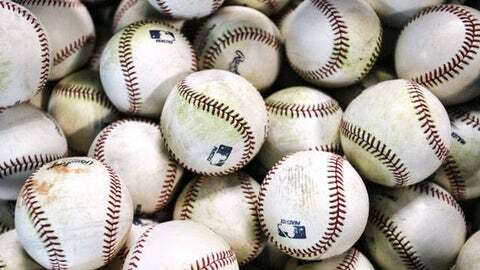 Every baseball player has an offseason job – to come back to spring training in the best shape possible and be ready to play Day 1. The other side of me — the emotional side — is going crazy! I have been a Marlin since they signed me in 2006. I’ve been going to the same back fields in Jupiter, Fla., since I was 18 years old! The people who’ve helped me become a man, both on and off the field, are employed mostly by the Marlins. I hope those people know who they are because otherwise this thank you will fall on deaf ears. I am forever in your debt! They helped a young boy achieve his lifelong dream to be a Major League Baseball player! They were there for me in the toughest time of my life when my father passed away in 2010. People have speculated that I hold a grudge toward the Marlins for things that have happened in the past. I assure you that this isn’t the case! Did we always see eye to eye? No, but when I look back on my time I will think far less about the bad times and far more about the good. Contrary to public opinion, owner Jeffery Loria has been great and generous to my family in our greatest time of need. He let us use his plane to go to my father’s funeral in Kansas City. Then (president of baseball operations) Mike Hill, (general manager) Dan Jennings and (president) David Samson attended the funeral. Obviously, they didn’t have to do that. So, a special thank you to them as well. Now, for the men I had the absolute pleasure of competing with day in day out: from Dan Uggla and Cody Ross, who taught me how to play in the big league, to my closest friends Scott Cousins, Bryan Petersen, Giancarlo Stanton, Ricky Nolasco and Gregg Dobbs. There are many others who have helped me immensely along the way, but I would get carpal tunnel if I mentioned all of them. I named these guys because it adds weight to how much they mean to me. These are lifelong relationships and impressions that I will never forget. You lean on your teammates for advice on things from baseball matters to relationships with wives and girlfriends. I can honestly say that I love them with all my heart. They were and always will be a part of my family. This is what will be the hardest thing for me. I’m not sure I can explain this, but when you grind, sweat and bleed for one common goal, you hurt for them when they struggle, you cheer for them when they succeed. Not because you have to, because you want to. This is the beauty of the game. This is why I love coming to the field and competing every day. I will miss my current teammates a lot. I have told you all of these things to put you in my shoes, to see through my eyes. I feel sad, because I won’t be able to compete with Giancarlo (I still call him Mike in real life). I won’t get to talk to (Marlins special assistant to the president and MLB Hall of Famer) Andre Dawson in the clubhouse. I won’t be able to laugh and joke with David Samson before batting practice. I’m angry because I wasn’t able to stay healthy enough to hold a trophy over my head and spray champagne in my teammates face. I feel anxious because, I don’t know where I’ll end up. I don’t believe I fear the unknown in this case. I think I’m just excited to find out where I’ll be. I want to get it over with. The rumors affect my family more than me. For those who don’t know, I was raised a military brat. So, I am used to the gypsy life style. My wife has lived in Jupiter for nine years. She established roots that were just starting to blossom. She will have a harder time leaving than I will. My sister-in-law moved down there to be a nurse, but more importantly to be with my wife. Now we will be leaving her by her lonesome. I feel more than terrible about this. We all knew that this was a possibility, but it still sneaks up on you like finals to underachieving college kid. Lastly, I want to mention the fans who stuck with me and the team through thick and thin. I will miss the M-O-R-R-I-S-O-N chant, the screaming for autographs as we leave the stadium, the people who open the doors for us in and out of the stadium and clubhouse, the PR people, community foundation and the clubhouse attendants who make it so easy for us to go out and play every day. I want to thank all of you from the bottom of my heart. You have meant so much to this boy turned man. As I read back over this, I realize that I am pretty terrible at writing about serious stuff. Sorry for wasting your time!